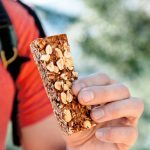 Transforming a school lunch classic into a portable hiking snack, these peanut butter and jelly granola bars are the perfect way to refuel out on the trail. PB&Js are not just a nostalgic childhood favorite; they’re also the go-to staple of many hikers and backpackers. Aside from the fact that they’re dead-simple to make, they are also loaded with calories. Combine that with the irresistibly sweet and salty flavor, and it’s no wonder these sandwiches are a beloved hit. However, PB&J sandwiches do have one problem. Too often have we reached into our packs hoping to pull out a fresh PB&J, only to find a ziplock bag containing a peanut butter and jam massacre! The bread is mutilated, the jam has blown out of one side, the peanut butter out the other. Witnessing a tragedy like this can really set you back a few steps and take the air out of your lunch break. So to avoid this, we decided to try to condense the essence of PB&J into a more portable bar form. Something that can be tucked into a backpack without a second thought. 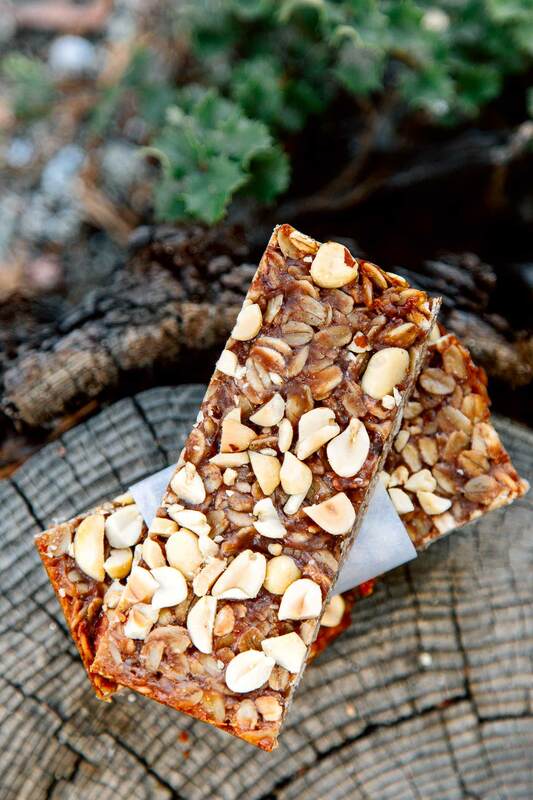 After a few test, we think these PB&J granola bars are the answer we’ve been looking for. 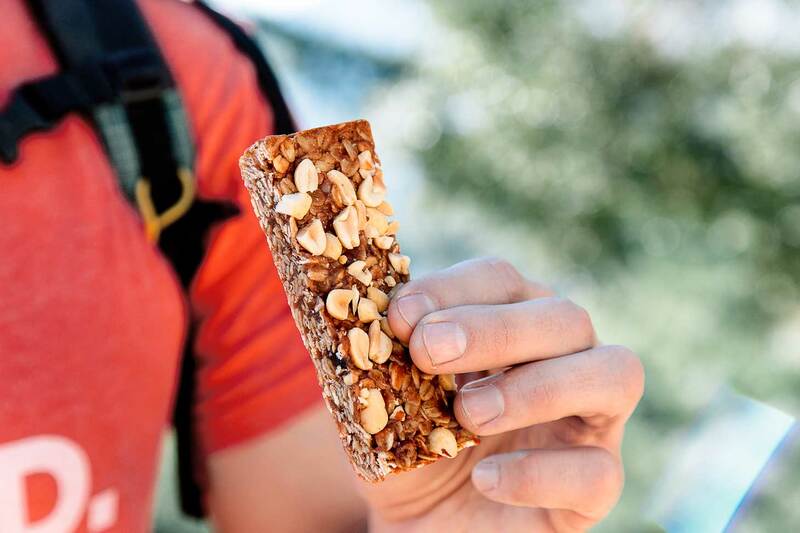 While nothing will ever fully replace a freshly made PB&J sandwich, these go-anywhere granola bars can satisfy your craving when you’re on the go. Make a batch ahead of time. You’ll thank yourself later. Preheat the oven to 350. 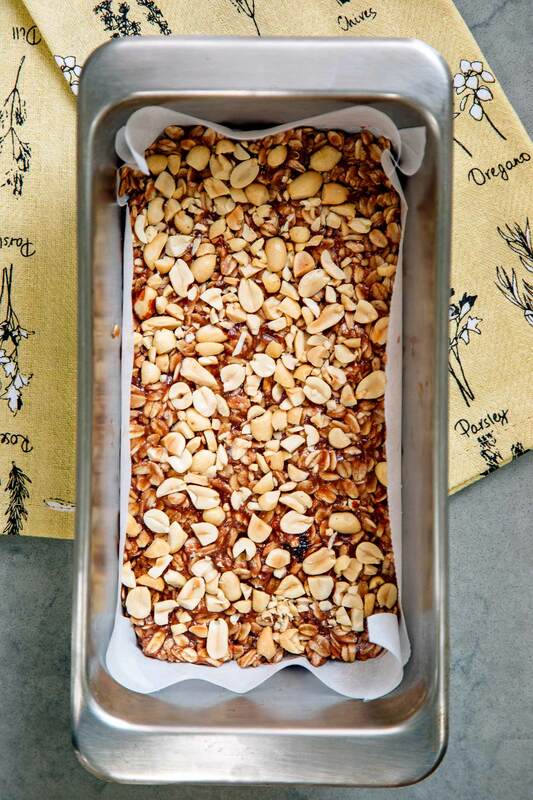 Line a 9X5 loaf pan with parchment paper or foil. Spread the oats on a baking sheet and toast in the oven for 10 minutes, stirring at the 5 minute mark to ensure they toast evenly. Remove from the oven and set aside. Heat the jam, peanut butter, sugar, oil, and salt in a small saucepan. Simmer for about 3 minutes over medium heat until slightly thickened, stirring constantly. Dump the toasted oats into the pot and stir to thoroughly coat. Bake the bars for 15 minutes until golden brown. Remove from the oven and allow to cool. Remove the bars from the pan and cut into bars using a sharp knife. This recipe first appeared as part of our Three Squared column in Adventure Journal Quarterly. These sound delicious and I love how healthy and nutritious they are. Can’t wait to try them! Thanks! Niceee, thanks for the recipe! Do these need to be kept cool, or could they survive a 5-7 day backpacking trip? They hold up at room temperature just fine and could potentially make it for a 5-6 backpacking trip. They’re tough, but not indestructible. So some caution advised. We recommend testing them out before the big trip.